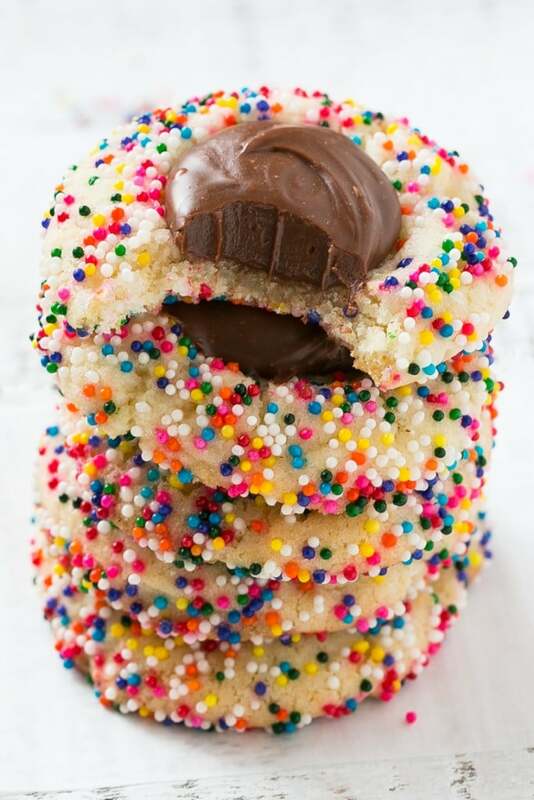 These chocolate fudge cookies with sprinkles are a soft sugar cookie topped with a rich and creamy fudge filling and finished off with rainbow sprinkles. The perfect treat for the holidays or any other festive occasion! I’m always looking for easy yet delicious holiday cookies for gift giving, and these chocolate fudge cookies definitely fit the bill. You can switch up the sprinkle colors to make them fit for any event! You know what they say about it being the most wonderful time of the year! I try to spread holiday cheer whenever possible, and as a food blogger that means I’m busy in the kitchen baking treats to give to our family and friends. I have three eager little helpers who love to help with the cookie-making process, and when we bake together I like to keep it simple. I often turn to Betty Crocker® Sugar and Peanut Butter cookie mixes to make our baking sessions fun and to save some time. Because who isn’t pressed for time right now? This season passes so quickly and sometimes I feel like my to-do list is a mile long! How do you make chocolate fudge cookies? We recently had family visiting from out of the area and the girls and I set out to make some cookies to greet them with upon arrival. 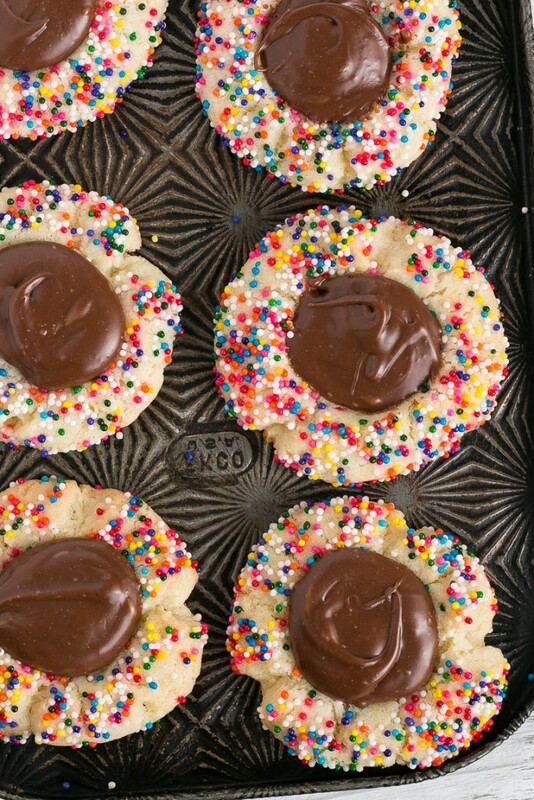 I wanted to make something colorful and festive and came up with these chocolate fudge cookies with sprinkles. I used Betty Crocker® sugar cookie mix to quickly whip up some dough, rolled the balls of dough in sprinkles, then used a measuring spoon to make an indentation in the middle of the cookie before baking. After the cookies came out of the oven I made a simple 2-ingredient fudge filling and spooned it into the centers of the cookies. In no time at all I had impressive looking cookies that the kids loved making and our guests loved eating. 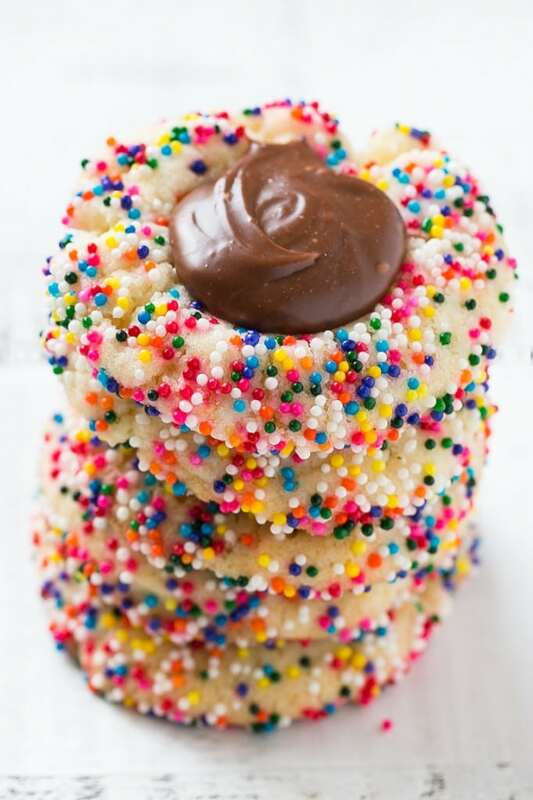 These colorful cookies are perfect for the holiday, but you could also make them year round and change up the sprinkles depending upon the season. 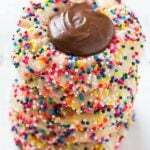 I also think they’d be great for birthday parties – who wouldn’t get instantly happy at the sight of all those sprinkles? What kind of holiday baking traditions does your family have? 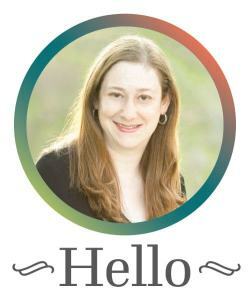 I’d love to hear about your favorite seasonal cookies! In a large bowl mix together the cookie mix, flour, melted butter and egg until a soft dough forms. Place the sprinkles in a shallow bowl. Scoop out tablespoons of dough and form it into balls. Quickly roll the balls of dough into the sprinkles and place 2 inches apart onto a cookie sheet lined with parchment paper. 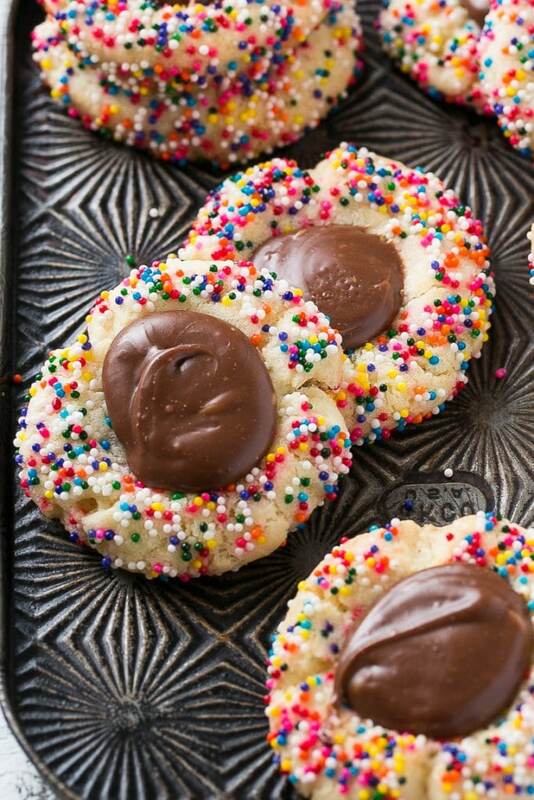 Using the back of a teaspoon measure, make an indentation in the top of each cookie. Bake for 8-9 minute or until cookies are lightly browned on the edges and just set. If the indentations have filled back in during the cooking process you can use the teaspoon to press them back into shape with the cookies are still warm. Repeat the shaping and baking process with the remaining dough. Heat the cream in the microwave for 30 seconds or until very hot. Pour the cream over the chocolate chips and stir until all of the chocolate is melted and mixture is thoroughly combined. You may need to microwave the mixture for 5 second intervals if the chocolate does not fully melt. Spoon approximately 1 teaspoon into the center of each cookie. Let the cookies stand for at least 30 minutes so that the fudge centers can firm up. Store cookies for up to 3 days in a resealable container. These looks so yummy! I know my boys would eat an entire batch if I let them! No more dipping my sugar cookies in the hot fudge! You are my hero! These look so tasty! I love fudge! You had me at fudge. Such easy and adorable cookies that would be easy to customize to any party theme as far as the colors go! These are so cute! I bet they also taste amazing! That fudge center! HOLY COW! Perfection. I’m gonna make these for Christmas in July celebrations. Oh man, these photos are making my mouth water! Yum!